My favorite recipe for Challah French Toast is made with a secret ingredient– banana! The addition of a ripe banana to the coating adds healthy sweetness for a light and fluffy texture. The result is absolutely delectable. Challah and French toast are just meant to be together. French toast is a weekend tradition in our family. It all began when I first tackled the art of making a beautifully braided challah. It took me countless tries of braiding and baking before I was happy with my technique. Those first few weeks of experiments resulted in copious amounts of challah piling up in our kitchen. Luckily, my husband makes a mean French toast… and no bread is better suited to this sweet breakfast treat than eggy, fluffy challah bread. 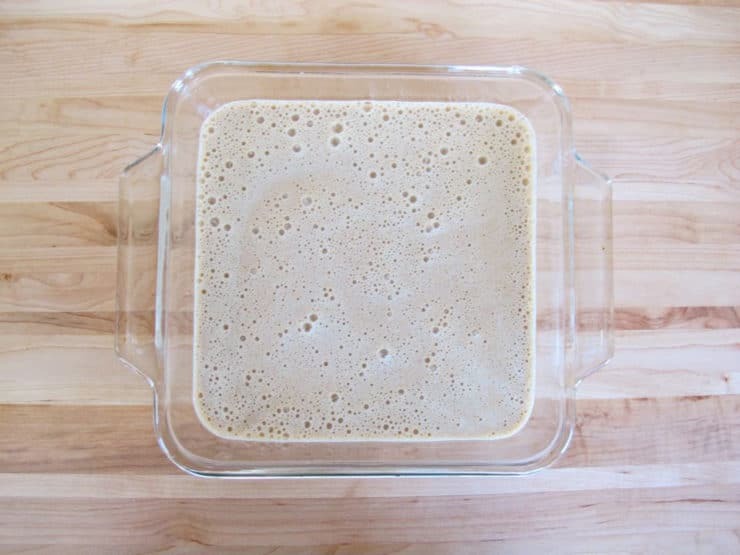 Challah acts like a sponge, soaking up the liquid mixture and saturating itself with goodness. 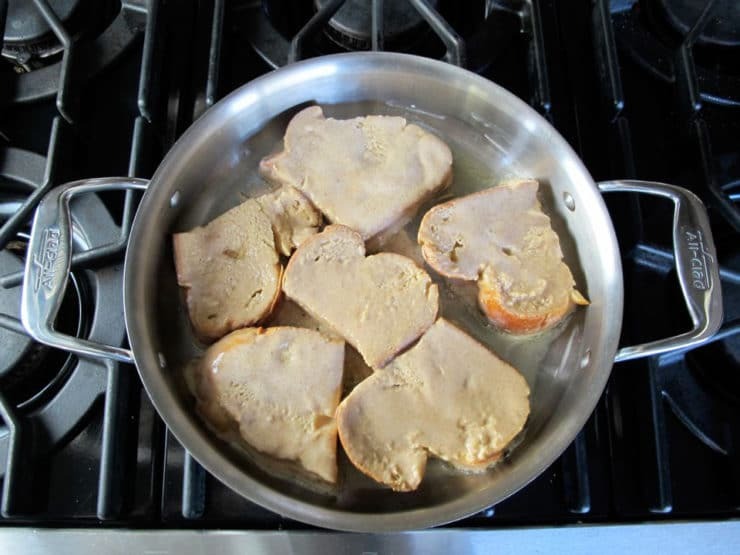 My stepdaughter loves her Abba’s French toast, and she loves it even more when we use challah. What a treat! Another sweet: break grated Sigilines (wheat bread) and make larger bites. Soak in milk, fry in oil, douse in honey and serve. As you can see, the basic method for cooking French toast hasn’t changed much throughout the centuries. Eggs didn’t appear in a printed recipe until 1870. The practice of soaking bread and then frying it most likely came about as a way to use up bread that had gone stale to make it more palatable. Where the “French” name came from is not exactly clear; there are many theories, but the actual source of the name is a culinary mystery. Our version of Challah French Toast is easy and versatile. We like to use homemade challah when possible. On the weeks when I am running short on time, we pick up a challah from our local bakery. To make the milk mixture for the French toast thicker and naturally sweet, I add a banana and blend it together with a little flour. A touch of rum or Grand Marnier is optional, but tasty. The resulting French toast is seriously amazing. It’s fluffy, airy, and not at all soggy. This preparation is much lighter than other recipes I’ve seen that drench the bread in cream, sugar, and butter. I much prefer to give the bread a rich flavor without a ton of sweetness and excess fat. That way, people can add as much syrup or butter as they want and adjust the sweetness to taste. It might not be “health food,” exactly, but it makes your soul happy… and we all deserve a little treat once in a while. Speaking of treats, I think I might make “brinner” tonight. There is nothing we love more than serving breakfast for dinner, especially when the entree is a delicious batch of Challah French Toast. Learn to make fluffy Challah French Toast with milk, banana, cinnamon, vanilla, sugar, & optional liqueur. Note: If you don't have challah on hand, you can substitute brioche or any fluffy, eggy bread you prefer. This recipe works best with day-old or slightly stale challah bread. If your bread is fresh, you can take some of the moisture out by placing the slices on a baking sheet and putting them in a preheated 350 degree oven for 10 minutes, flipping the slices once halfway through cooking. This will dry the bread out a bit, which will help it soak up the moisture from the milk and egg mixture. If you don't have time for this step, no worries-- fresh bread will work too, it just won't soak up as much of the egg mixture. 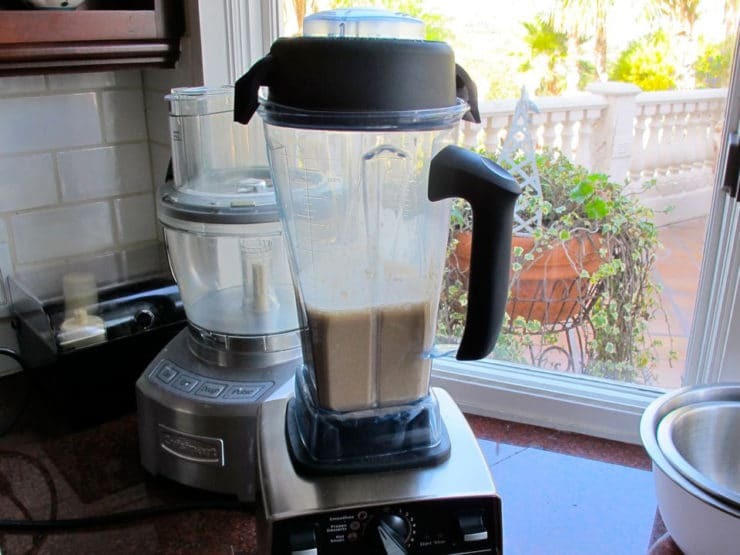 In a blender, combine the milk, eggs, flour, banana, brown sugar, vanilla, cinnamon, salt, and optional rum or liqueur. Blend for a few seconds until well mixed. Pour the liquid mixture into a shallow baking dish or pie plate. 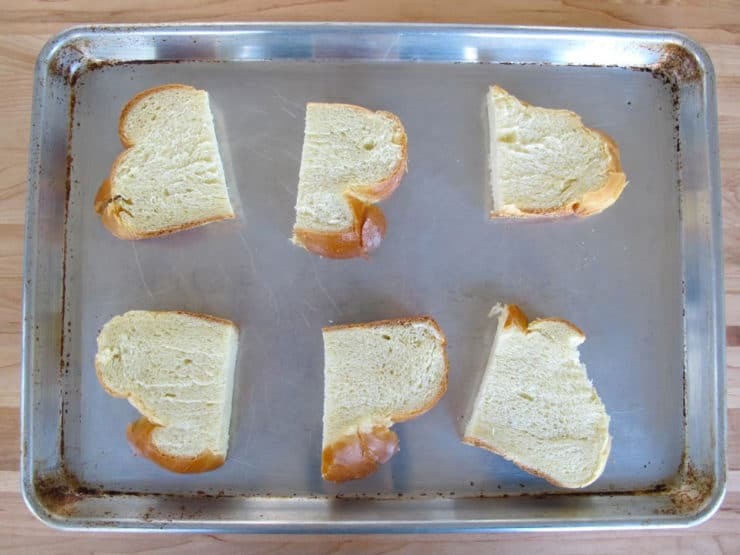 Soak your slices of challah in the liquid for about 60 seconds, turning once, until the bread is nicely saturated on both sides. This should be done in batches. 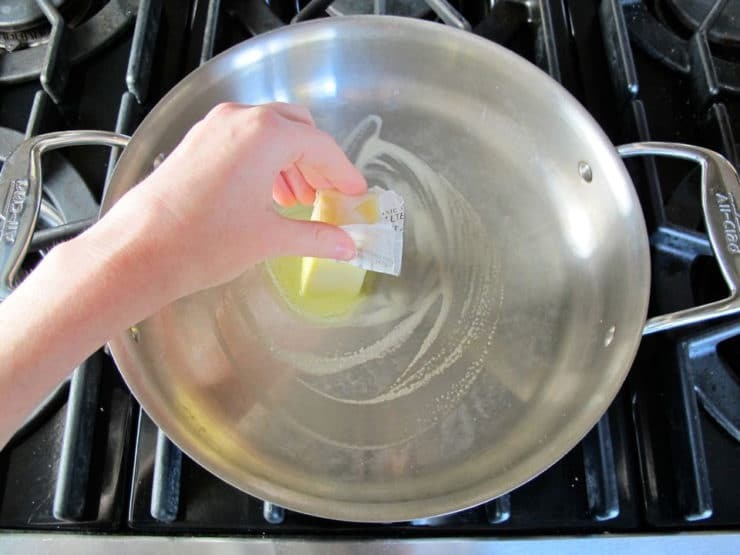 Heat your skillet over medium and grease it with 2 tbsp butter. Fry the toast in two batches of 6 slices each. Let the slices brown nicely on each side for 3-5 minutes. Keep the heat on medium (or a little lower) to make sure the toast cooks through but doesn't burn. 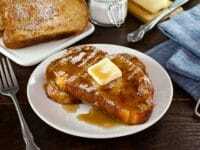 When the first batch of toast is cooked, regrease the pan with remaining 2 tbsp of butter and fry the second batch. Plate the French toast and garnish with powdered sugar, using a mesh strainer to lightly and evenly powder the toast with sugar. 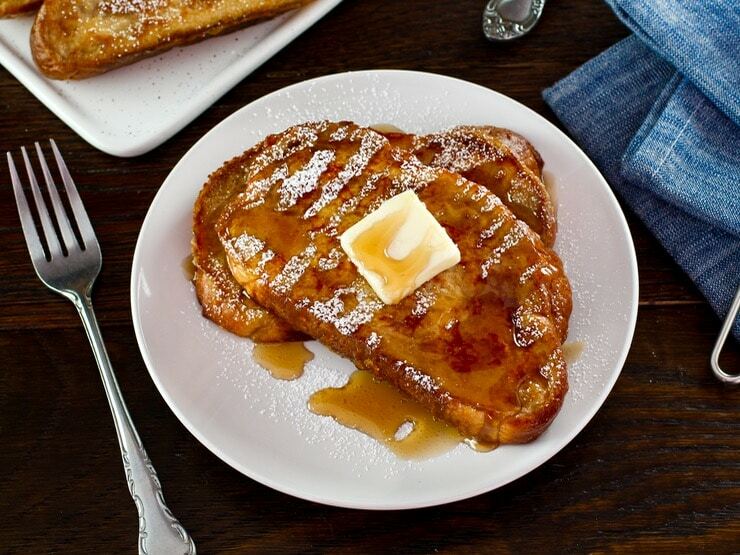 Serve Challah French Toast hot with your preferred toppings. Some of our favorites include butter, maple syrup, berry topping, caramelized bananas or fresh whipped cream. Would this recipe turn out okay if it were baked? I think it might, but I haven’t tried it that way so I don’t have specific instructions for you. Please tell me more about the added caramelized bananas!!! That sounds amazing and I’m always looking for more creative ways to eat and serve bananas! Would love to try this with my daughter, but with just the 2 of us can I freeze and reheat the extras for breakfast on busy school days? this is a wonderful recipe. i refrigerate leftovers and reheat for up to 3days. i haven’t tried with the liquor. 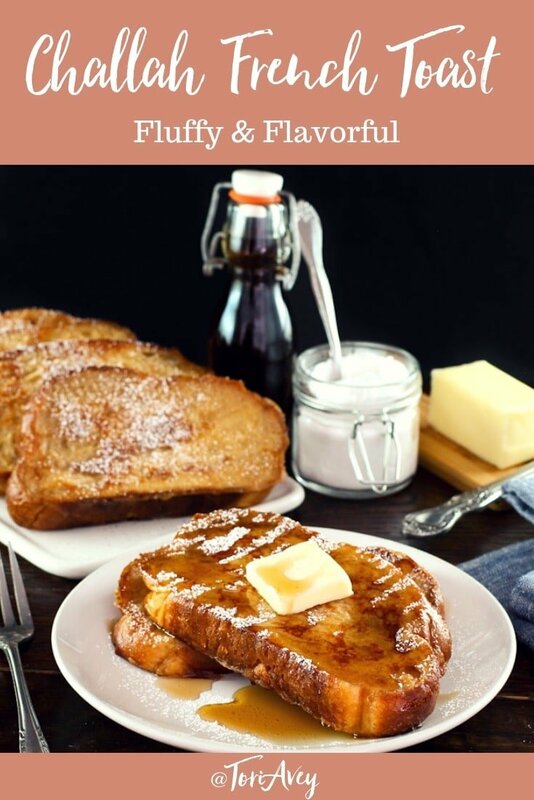 This is my new go to recipe for French toast. The challah bread and addition of the banana makes it rich without overly sweet. I also have substituted soy milk for my lactose intolerant husband and still tastes delicious! Love it and so quick and easy. Thank you!! I’m usually not a fan of french toast and neither is my wife, but WOW! I made this a few weeks ago and we ate the whole thing between the two of us. That batter plus the challah bread is amazing. Making it again tomorrow actually love this. Will be back looking at other recipes on your blog. Thanks for letting us know how you liked the recipe Chris. Welcome to the blog! Done Sandy, you should receive a confirmation email– click on the link to confirm. Thank you for subscribing! 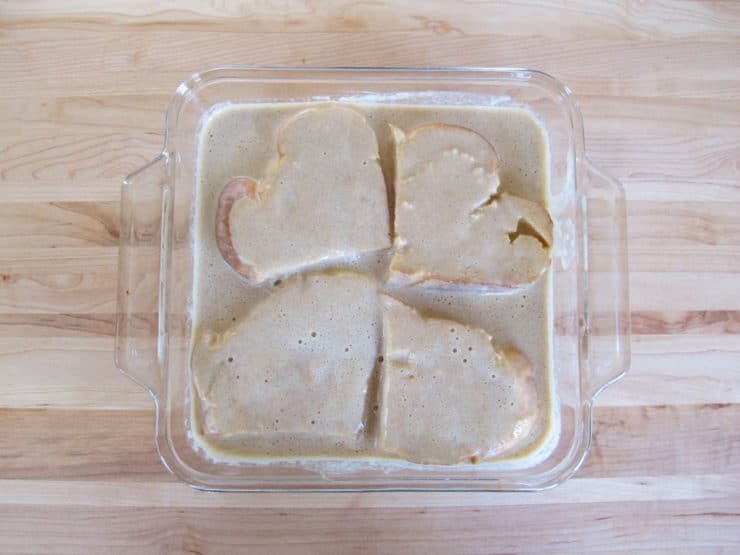 I am planning on trying this for Valentine’s day brunch, but I have a few questions about the Challah. I have made your regular Challah once before and it turned out beautifully. I was thinking of adding golden raisins and potentially cinnamon this time to better cater the bread toward french toast. Have you tried something similar? If so, did it turn out too sweet? Also, I am planning on making the Challah today (Thurs. night) and the french toast on Sat. morning. Do you think this will be enough time for it to get to the correct level of stale. Or should I pre-cut slices and leave them out overnight? Thanks so much for all the recipes and baking advice! Hi Jennie, sorry I didn’t get back to you sooner, I spent Valentine’s week battling the flu. 🙁 For future reference, adding the raisins and cinnamon to the dough shouldn’t be a problem; it won’t sweeten the dough beyond the natural sweetness of the raisins themselves. You don’t need to wait for bread to get stale for French toast– just toast the bread slices lightly in the oven at 350 degrees on a baking sheet for 5-10 minutes till it’s dry and very lightly toasted. It will soak up the ingredients beautifully. This was the best French toast I’ve ever had! Awesome! Great to hear that Amy! I stumbled upon your blog today and tried out this recipe. My husband and I both enjoyed the Challah French Toast. I really like the addition of the banana in the mixture. Thanks for sharing. I look forward to trying more of your recipes! Glad you enjoyed it Stephanie! I have become very addicted to your blog! My husband and I lived in Israel for a little while and would love to go back and live there with our children. Right now we live in Russia. Your blog brings some sanity back into my life when we are stuck inside due to cold weather. Thanks so much for teaching me to make Challah. Every time I make it we have to have Challah French Toast as well. Thanks again! It is delicious! Blessings! This was our first time making this recipe for desert after dinner and my princesses absolutely devoured it. I had to restrain them from finishing the pieces to be able to leave a couple for each of them for breakfast. We had a guest to visit and she loved the recipe! Thank you soooo much for sharing. Tera Nova tests are coming up for my daughters in their schools. My 1st born princess asked me to make more of these for breakfest during the weeklong testings! We love it!! Can the mixture for this recipe be refrigerated overnight to cut prep time in half? I emailed, but then noticed you said commenting responses might be faster! Either way…this recipe is worth the wait! Hi Kelly– yes, but the mixture will likely settle overnight, so you may need to whisk it to refresh in the morning. Also, the banana may oxidize a bit and give the mixture a brownish color– but don’t worry, it will be masked by the cooking process when he toast turns golden brown. I wouldn’t keep it in the fridge for longer than 24 hours, but overnight should be fine. Enjoy! Tried it for the first time for a brunch of 10 women! They devoured it and it was so easy to make. Everyone adjusted the toast to their level of sweetness and it was perfect in texture and not soggy at all. Love the extra banana and rum in the mix. I will try it again for my hubby tomorrow! THank you for this amazing recipe! Umm… My two girls and I just rocked “Breakfast for Dinner” – this is the BEST French Toast Recipe ever! Crispy, light & fluffy custard – everything French Toast should be! YUM YUM YUMMY! This recipe was absolutely yummy! I ate it with raspberry sauce and used Agave instead of brown sugar. Also used honey butter to cook the french toast in! My family is in for a wonderful treat this holiday season! I froze the excess for another time as well! Oh my goodness, that looks delicious!! Sadly, I have never been able to find challah in my area. I will have to look again! I love the banana idea, but I have also mixed egg/milk/vanilla and cinnamon into the mixture as well as added a little fruit yogurt. Challah is the best, but if not available, potato bread can also serve the purpose. I served mine with raspberry sauce! It was wonderfully delicious! Adding a tsp or so of real vanilla extract does wonders! So does a small amount of nutmeg! Also, I soak the challah in the egg mixture the night before….the next morning I pan fry it and it is delicious and almost custard like even when well cooked. enjoy! How interesting to blend banana in with the eggs… must give it a try sometime! Thanks! Oohlala. That is the most mouthwatering French toast I have ever seen. I didn’t know Kahlua and French toast go together. I shall try this soon…maybe tomorrow. LOL. I am convinced challah makes for a perfect Frech toast. Its heavenly. And with liquor? Ooooh now we are talking. 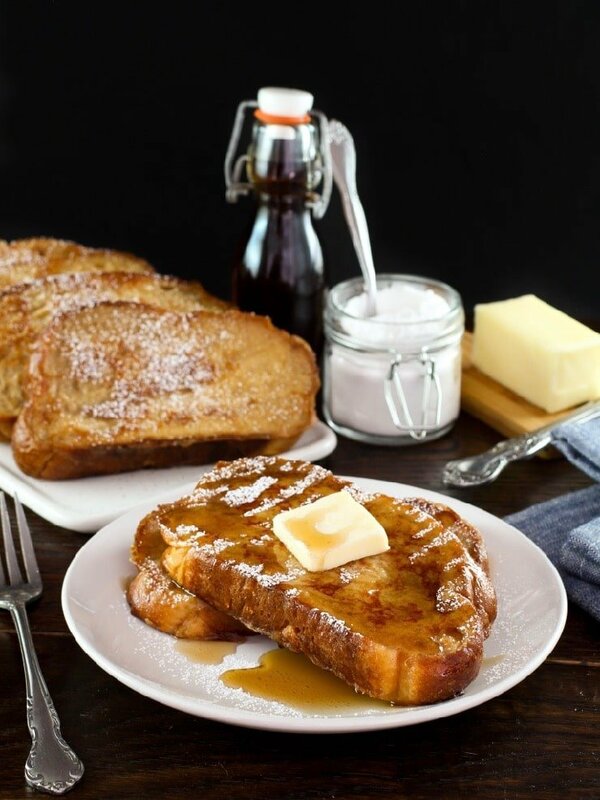 Oh, I adore French toast made with challah…and the addition of Kahlua is perfect!!! YUM. Sounds gorgeous. 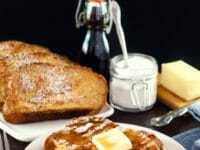 Love challah and love French toast, so the combination should be spectacular. I’ll make that as an anniversary surprise next Shabbos as it is our 24th wedding anniversary. Thank you for posting this recipe. This looks amazing! And since I have a full challah loaf sitting in front of me, I think I’ll make this for breakfast tomorrow. It looks so good, I wanna have it for breakfast…and afternoon snack! 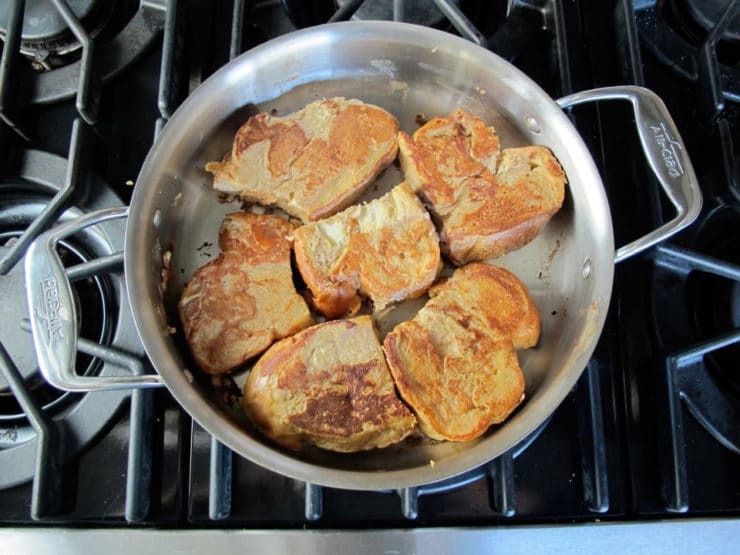 And, you’re right… there’s nothing better than French Toast made with Challah. I don’t even need syrup… just a snowfall of powdered sugar. We just had a lesson on yeast bread (including challah) in class today and I am so excited to start making some! YUM! Oh man, I just made French toast with homemade Challah last week, and it IS amazing. I also used a stale loaf in a raspberry bread pudding recipe which was equally spectacular. Gotta go make more Challah! I always make French Toast with challah. Raisin challah is even better that the plain. I love the idea of blending in a banana. Will try it tomorrow morning. I also melt no sugar added jam or jelly to pour over the finished product instead of syrup. Oh I dream about this. My goal for this year is to make a braided challah and then make french toast! My favorite bread for French Toast – bar none. Could slide it off the monitor and have it now. Challah makes the best french toast hands down! This sounds lovely! Sounds delicious, especially with bread or challah that’s homemade! I’ve been making French toast for years and like you, I don’t like it really sweet. Definitely will try! Breakfast for dinner is something I indulge in every once in a while too! One thing I have not indulged in is using homemade bread to make french toast. No doubt it does make a big difference in the taste. Homemade challah is a great choice! Oh and the banana and rum in there makes it even more amazing. Great post Tori! Yum! Challah french toast is my favorite!! This sounds incredible! Lovely idea! 🙂 I enjoy challah, so this should be fantastic!